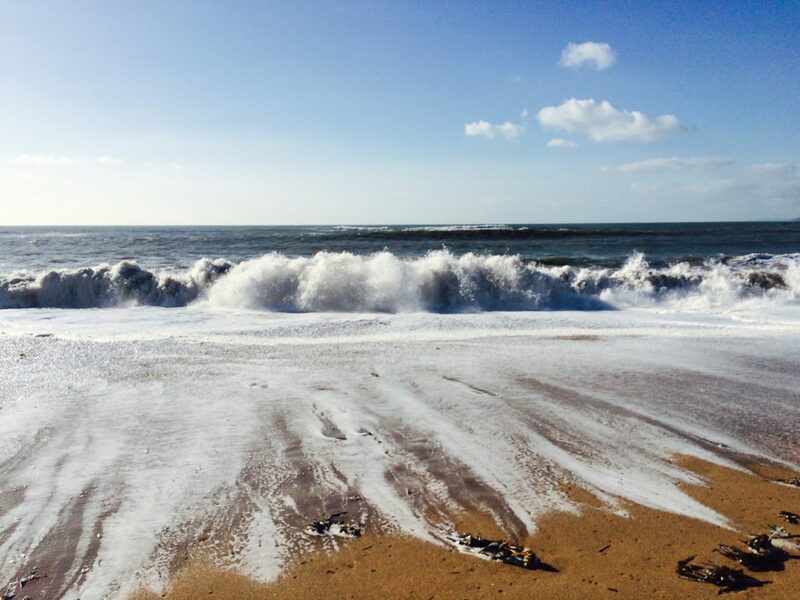 Recent research reveals that being close to the sea has an incredibly positive impact on our mental wellbeing and physical health. The benefits of ‘blue space’ appear to be hardwired into our brains – perhaps leftover from before we created this fast-paced, tech-crazed world we inhabit today. The ocean inspires us and makes us feel connected to something that is bigger than us. Taking time out to be mesmerised by the sight and sound of waves relentlessly surging and retreating with the tide, and picturing it happening simultaneously on beaches all over the world, makes us realise that everything is connected. When we appreciate that these waves have been crashing onto shorelines for millennia, and will continue to do so long after we have gone, it gives us a sense of perspective. The world doesn’t revolve around us, and our wants and needs. 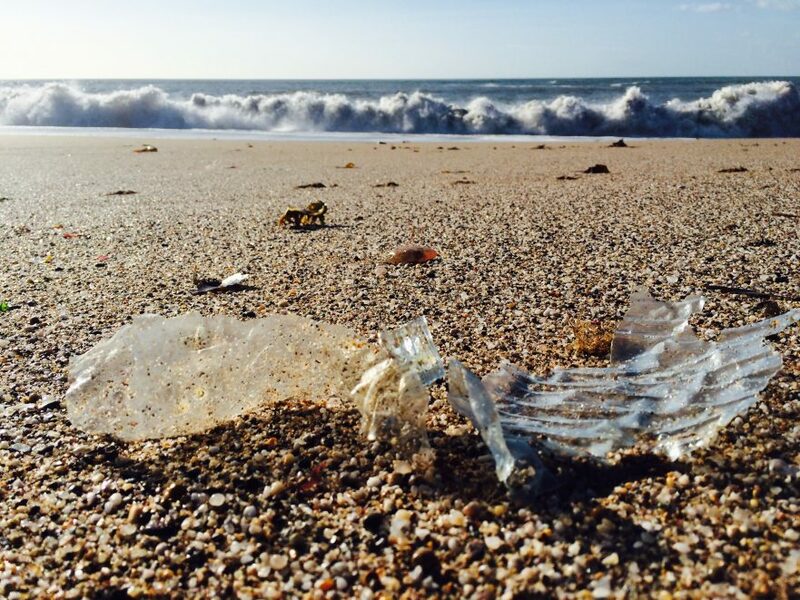 However, walking along beautiful beaches and finding fragments of plastic bottles, bags, cups, straws, cutlery, food packaging, and numerous other sorry examples of human invention, is an unwelcome twist in the story of our relationship with the ocean. Dive deeper, and you soon discover the problem is far worse than it first seems. It’s not just the visible ocean plastic with its heartbreaking ability to entangle, choke, poison and starve countless marine birds and wildlife. It’s the seemingly pristine waters in remote places containing worryingly high volumes of tiny toxic plastic particles (broken down by waves and sunlight over the years) that are now starting to outnumber the plankton that form the base of the marine food chain. This so-called smog of the sea is being mistaken for food by the fish and seafood we eat. The massive accumulation of plastic we have dumped in the ocean is coming back to bite us as it is served up on our (disposable plastic?!) plates. 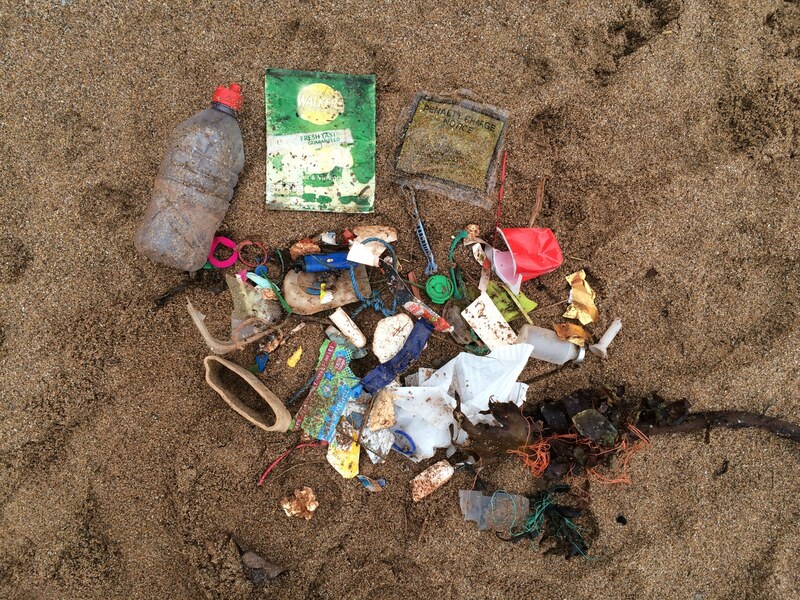 Spending time by the sea, and seeing the evidence of our throwaway society first hand, I discovered I could no longer compartmentalise in my head the rubbish on the beach and my own lifestyle choices. It is estimated that around 50% of all plastic produced is used just once before being thrown away. Inadequate waste management systems on land result in the equivalent of one refuse truck-load of plastic being dumped in the ocean every minute. At this rate, by 2050 there will be more plastic in the sea than fish. Our throwaway society values cheap, fast, convenient products, but it hasn’t always been this way, and it’s not too late for us to open our eyes to the problem and change. They say the greatest obstacle to change is apathy. Yet how can we feel apathetic about the declining state of our amazing, awe-inspiring oceans; our wild, windswept beaches; and the incredibly diverse array of wonderful creatures that inhabit them? In addition to their aesthetic and recreational qualities, we rely on our oceans to provide 70% of Earth’s oxygen and 17% of our global consumption of animal protein. So it makes sense for us to look after them. It’s tempting to feel depressed and overwhelmed by the story so far, but feeling hopeless is not going to result in a good ending. The best antidote is to get busy, and start taking positive action. 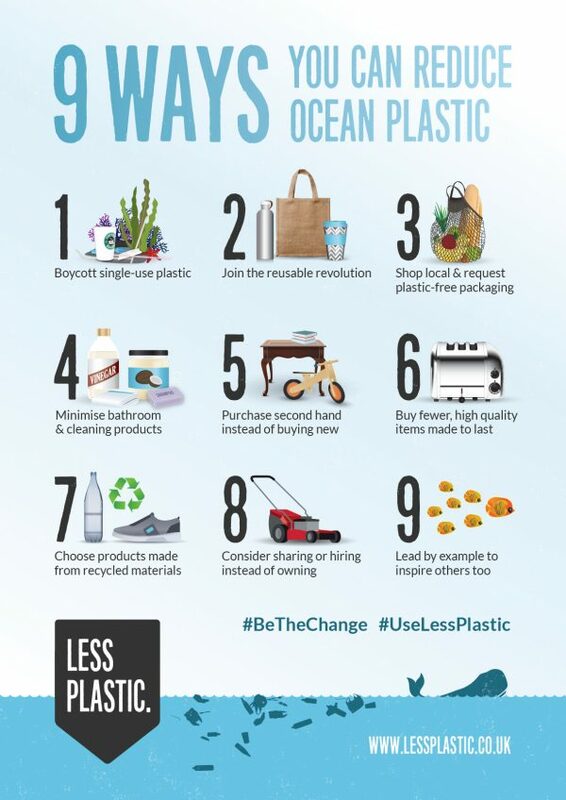 Do something yourself today to tackle ocean plastic! 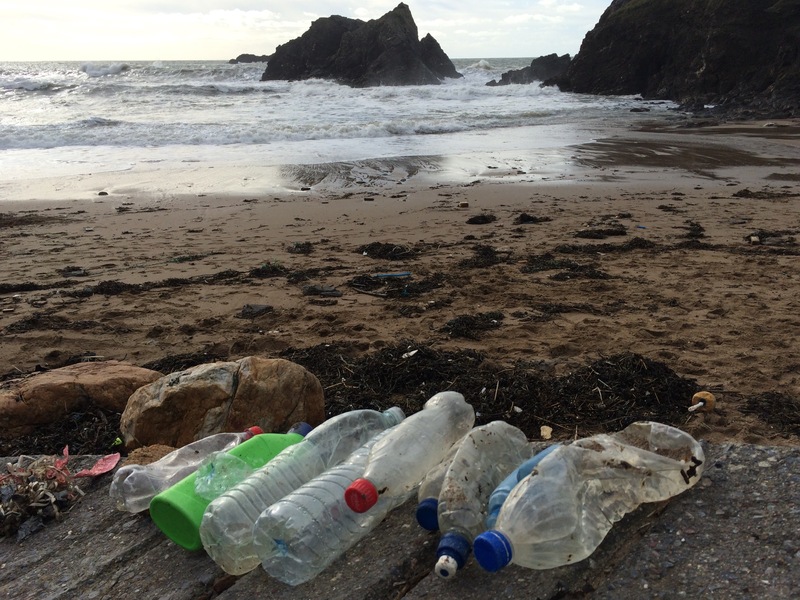 Yes, governments and big international organisations have a responsibility to pass laws to make it easier for us all to make the right choices – for example introducing a deposit-return scheme to keep plastic bottles out of the ocean. However, these initiatives take time to agree and implement, and are not consistent globally, and we all know that ocean plastic is a global issue. Meanwhile, every day the consequences of our throwaway society are accumulating in the sea. We need to act urgently! The simple solution lies in our hands. We ALL have the power to do something to change the story of ocean plastic. Think about your own life. If you succeeded in giving up single-use plastic bottles, bags, cups, take-out containers, cutlery… what difference would that make? 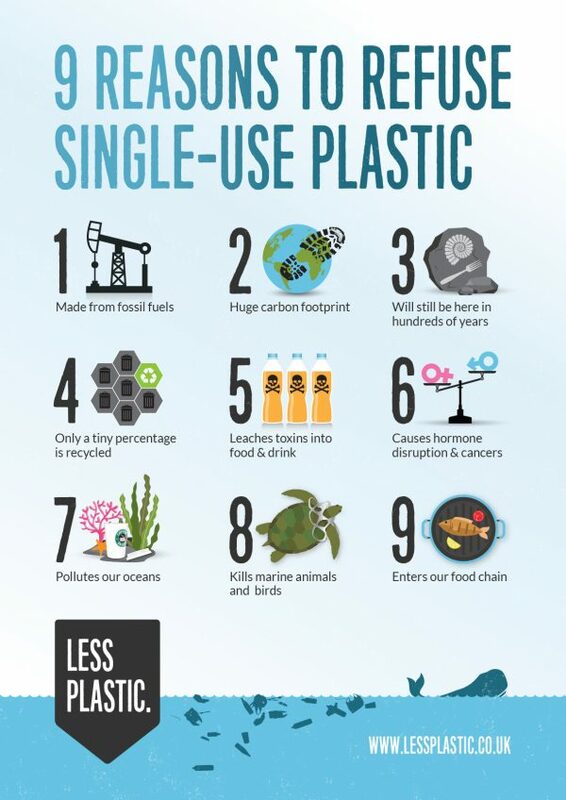 How much less plastic would you throw away in 1 week? In 1 month? In 1 year? The rest of your life? Now think about what would happen if you did nothing, and if no-one else cared enough to do anything either. What would our oceans and beaches be like in 5, 10, 20 years? 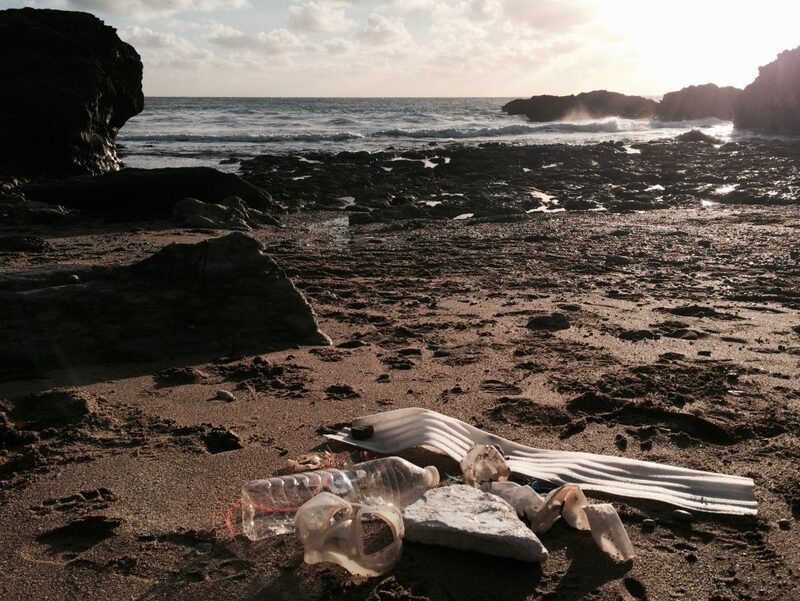 There’s a growing section of society that is waking up to the problem of disposable plastic. The momentum is gathering quickly as high-profile celebrities and the mainstream media jump on board with the “refuse single-use plastic” message. 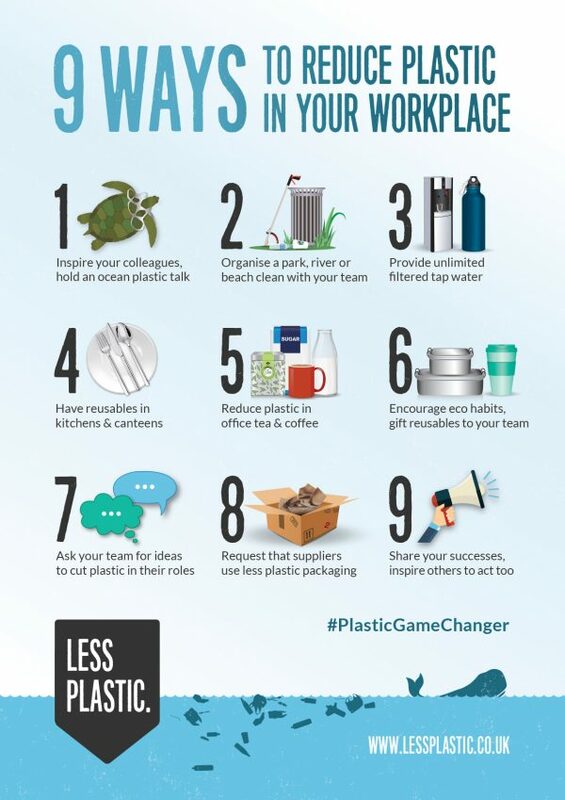 By taking small, consistent actions ourselves (such as always carrying a reusable water bottle and coffee cup, or choosing loose fruit and veg and skipping the plastic produce bag) we reduce the demand for plastic, whilst sending a message to the government and corporations, who have more power and resources to effect even greater change, that the public cares. For example, in the UK pressure is mounting on supermarkets to offer a plastic-free aisle. This has come from consumers and campaigners who are fed up with having no choice but to buy everything encased in plastic. Don’t leave it to someone else to tackle ocean plastic. If you love the sea, you need to do something meaningful yourself. Begin with little things that you do every day, they will add up over time to make a big difference. 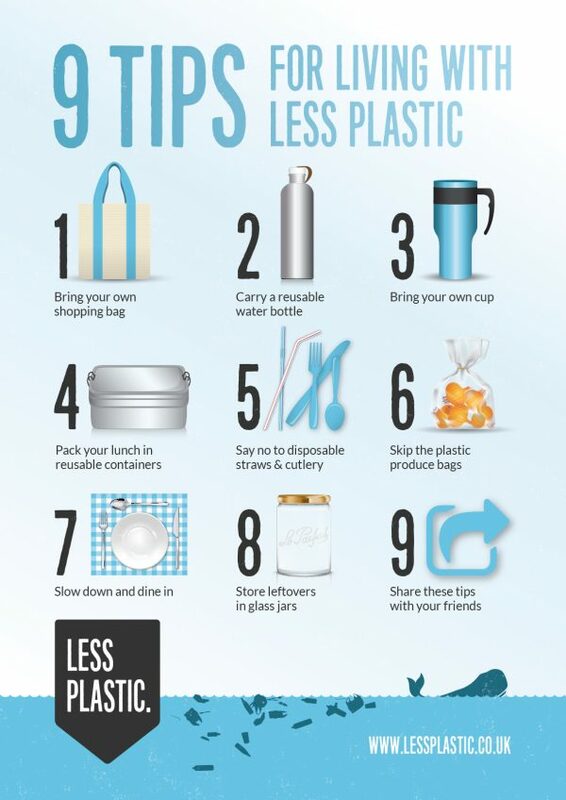 See our 9 tips for living with less plastic to get started. We need a vision that is bigger than ourselves. We can’t fix this problem alone, but we can be part of a positive movement determined to do what it takes to stop the flow of single-use plastic flooding into the ocean. 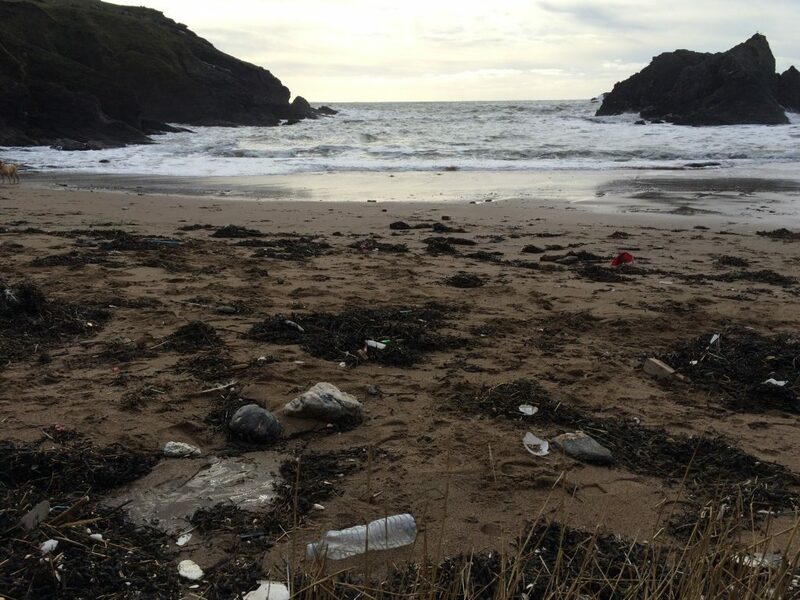 Do you want future generations to inherit our plastic mess, or would you like to leave a more positive legacy? Together we can change the story of ocean plastic, but we have no time to lose, so let’s start today! I have just read an article in the Western Morning news West magazine and picked up this website from said article. I had a letter of mine published in the Western Morning News newspaper only last week on the appalling and upsetting amount of plastic litter I encountered on a walk around the village in which I live. I am trying to do more to reduce plastic although when supermarkets do things like changing glass jars of honey into plastic ones and put coffee whitener into a plastic container when it has always been in a box what can we do? I want future generations to be in recovery from this plastic age.